$46.629 million on 3881 screens. 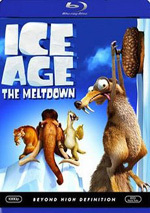 While I can’t say I disliked 2002’s Ice Age or 2006’s Ice Age: The Meltdown, I also can’t claim that they did much for me. I thought the first two Ice Age flicks offered passable entertainment but not much more. Because of that, 2009’s Ice Age: Dawn of the Dinosaurs came as a pleasant surprise. That one seemed substantially more enjoyable than its predecessors and meant that for the first time, I left an Ice Age effort with a big smile on my face. Ice Age: Continental Drift. Prehistoric squirrel Scrat’s (voiced by Chris Wedge) obsession with acorns causes mayhem, as his pursuit inadvertently causes the break-up of the continents. When the land splits, our main characters become separated. Manny the mastodon (Ray Romano) finds himself stuck with old pals Diego the saber-tooth (Denis Leary) and Sid the sloth (John Leguizamo) as well as Sid’s nutty old granny (Wanda Sykes). They float off on an ice floe but Manny swears he’ll find his wife Ellie (Queen Latifah) and daughter Peaches (Keke Palmer). We follow this pursuit as well as complications that involve a gang of pirates led by ape Captain Gutt (Peter Dinklage). Although I saw Drift theatrically barely five months ago, I couldn’t remember its story when I started to write this review. Granted, this isn’t super-unusual for me; I watch so many movies – theatrically and at home – that I often lose track of the specifics. But that wasn’t the whole case here. It’s not that I couldn’t recall the details of Drift - I completely forgot anything about the movie. Which is what we call a “bad sign”. If a viewer totally forgets everything about a film, that may be an indication that it’s not a flick that made much of an impact. Of course, it could be worse – I could’ve forgotten that I ever even saw Drift - but it’s still not promising. I’m starting to think that my enjoyment of Dawn of the Dinosaurs came almost solely due to its use of the delightfully unhinged weasel Buck. Before he entered the film, Dawn seemed as mediocre as its predecessors, but with Buck on the scene, the movie immediately came to life. Buck remains on the sidelines for Drift, and none of its new characters offer suitable replacements. I like Dinklage, but Gutt offers a forgettable villain, and other newcomers such as Jennifer Lopez and Josh Gad do nothing to pick up the slack. Sykes occasionally threatens to bring some spark to the proceedings, but Granny’s another predictable part without much to make her fresh. Of the new roles, Peaches probably stands as the weakest link. She forces the movie into trite “teen angst” issues that are tiresome anywhere but seem especially out of place here. Palmer’s performance is fine, but Peaches is such a bland, generic character that she can’t do much. All of this means Drift reverts to the form of the first two movies. That’s not a terrible thing, as Ice Age and Meltdown delivered moderate pleasures. After the delights of Dawn, though, I hoped for more from Drift, so its lack of real inventiveness and fun make it a disappointment. 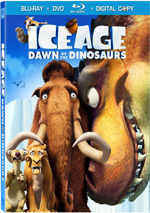 Ice Age: Continental Drift appears in an aspect ratio of approximately 2.40:1 on this Blu-Ray Disc. Like most computer animated flicks, this one offered a virtually flawless presentation. From start to finish, sharpness looked excellent. Even the widest shots came with terrific delineation and seemed crisp and detailed. Jagged edges and moiré effects never marred the image, and I noticed no edge haloes. Print flaws weren’t a factor. In terms of palette, Drift emphasized a bluish orientation to match the icy climes. Some brighter hues materialized at times, but the film kept things chilly, and that was fine; the colors looked strong within the film’s parameters. Blacks were dark and deep, while low-light shots came across as smooth and clear. This became a stellar transfer. On the other hand, the DTS-HD MA 7.1 soundtrack of Drift was less impressive than expected. While it opened up the spectrum reasonably well, it seemed a bit on the subdued side. The soundfield presented decent breadth and spread but didn’t feel as lively and immersive as anticipated. This meant the mix brought the action to life in an acceptable manner but not more than that. Even the louder seems came across as restrained and failed to deliver much punch. None of this made the track a major disappointment, but it ensured that the movie wasn’t as dynamic as I’d like. Within those restrictions, audio quality was fine. Music sounded clear and smooth, while effects were accurate enough; neither boasted prominent bass response, though, as low-end was acceptable and no better. Speech was accurate and concise. I felt the mix worked well enough to deserve a “B”, but I thought it’d be better than that. When we shift to extras, we find Party with a Pirate! Mode. When activated, this lets you see movie character Squint (voiced by Aziz Ansari) occasionally pop on-screen to comment – and by occasionally, I mean “very rarely”. Some other animated personalities show up to dance as well, and if you have the Picasso app, you can color characters along the way. It’s not an intrusive way to watch the movie, but it adds little value. Sign Along allows hearing-impaired viewers an alternate way to experience the film. In addition to the standard subtitles, folks can activate this and see interpreters in the lower righthand corner of the screen. This is an unusual way to translate the flick; I don’t know if hearing-impaired viewers will prefer it to subtitles, but it’s an interesting option. Called Ice Age: The Story So Far, a nine-minute, 29-second reel catches us up with the first three movies. 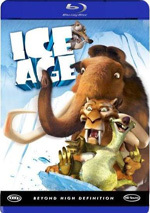 This offers a commentary-free compilation of scenes that cover the events of Ice Age, Meltdown and Dawn of the Dinosaurs. It probably won’t make you enjoy Drift more, but I think it gives us a fun overview. Under Missing Links, we get two deleted scenes. “Dr. Granny” (0:46) shows Granny’s attempts to revive a passed-out Sid, while “Shell Game” (1:00) portrays more of Scrat’s attempts to find his acorn. Both offer modest fun but they’re not missed from the final film. When we get to Through a Pirate’s Spyglass, we locate two featurettes: “Voices Ahoy!” (11:15) and “Capturing the Crew!” (14:42). In these, we hear from directors Michael Thurmeier and Steve Martino, character designer Peter De Seve, screenwriter Michael Berg and Jason Fuchs, producers Lori Forte and John Donkin, art director Nash Dunnigan, animation supervisors Jim Bresnahan and Nick Bruno, animation leads Scott Farrell, Stewart Shaw, Ken Huling, Tab Burton, Matthew Doble, Richard Fournier, Michael Richard, Jackie Tarascio, Eric Lin, Scott Carroll, Chip Lotierzo, and actors Peter Dinklage, Alain Chabat, Rebel Wilson, Aziz Ansari, Nick Frost, Kunal Nayyar, Jennifer Lopez, and Denis Leary. We learn about cast and performances as well as characters and design. The two programs focus on the new pirate roles and give us a lot of good information about those parts. The shows can be a little fluffy at times, but they’re usually fun and worthwhile. For the next piece, Granny and the Stink of the Sloths fills nine minutes, 12 seconds with comments from Berg, Donkin, Thurmeier, De Seve, Forte, Martino, Bresnahan, Bruno, story consultant Mike Reiss and actors John Leguizamo and Wanda Sykes. “Granny” follows the same path as “Spyglass”, except those featurettes focused on pirates and this one concentrates on the design and execution of the sloth characters. Like its predecessors, it offers good details and moves at a nice rate. Three more segments pop up under Whale of a Tale: Drifts, Rifts, Beasties and Myths: “Drifts and Rifts” (7:44), “Beasties” (8:00) and “Myths” (8:21). In these, we hear from Martino, Forte, Thurmeier, Donkin, Dunnigan, Bruno, De Seve, Bresnahan, Berg, Fuchs, UCLA geologist Stephen Salyards, Mythworks’ Pamela Jaye Smith, and marine biologist/neurobiologist Ricardo Gil-Da-Costa. The featurettes look at some of the science loosely adapted into the film and some story influences as well as more character design/execution notes. They fit in well with the prior programs and continue to offer useful material. The movie’s squirrel star features in the next couple of pieces. Scrat Got Your Tongue? (7:04) includes notes from Martino, Thurmeier, Bruno, Berg, Fuchs, Reiss, Bresnahan, and executive producer/actor Chris Wedge, while The Scratist (2:11) offers a trailer. “Tongue” resembles the prior featurettes, as it delivers info about the design/execution of the Scrat character – and throws in a delightful “how to sound like Scrat” tutorial from Wedge. “Scratist” simply takes shots from various Ice Age movies, makes them black and white/silent and mocks The Artist. It ran as an online promo for Drift and provides a clever ad. Shimmy Shake Music Section provides four elements. “Gutt’s Sing-Along Shanty Shimmy Shake” (2:18) is basic “croon along with the on-screen lyrics” fare, and “We Are” (1:59) is an “extended music video”. It’s little more than a compilation of movie scenes, and it’s forgettable; the song stinks, too. “Chasing the Sun” by the Wanted (3:22) offers another music video. This one melds movie shots with footage of the band as they lip-synch on ice floes. Neither the song nor the video are interesting, though both are better than “We Are”. Finally, “The Sid Shuffle” (3:12) lets us see Sid as he teaches us his dance. It’s nothing special, but compared to the other elements in this area, it’s fun. In addition to two Trailers for Drift, we find more ads in the Sneak Peek area. It provides clips for Epic, Diary of a Wimpy Kid: Dog Days and Ice Age: A Mammoth Christmas. A second disc provides a DVD copy of Drift. It’s a basic version without any extras. 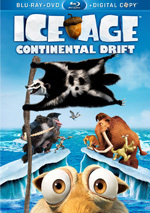 After the surprising fun of the third movie in the Ice Age series, I hoped the fourth - Continental Drift - would continue that positive trend. Unfortunately, it reverts to the form of the first and second flicks; it delivers occasional laughs but usually seems fairly mediocre. The Blu-ray offers excellent visuals, erratic but generally good audio and a roster of fairly informative supplements. While I’m not wild about the film, the Blu-ray brings it home well.